The vast majority of San Francisco’s street space is devoted primarily to moving and storing cars, and most of that curbside parking for private automobiles is given away for free. Most of the city’s street infrastructure is not paid for by fees related to driving, so it is disproportionately bankrolled by those who don’t drive, through general taxes. By any objective measure, the state of affairs on San Francisco’s streets is heavily tilted toward cars and designed to incur minimal personal cost to drivers. At least, that goes for those of us here in the reality-based community. Then there’s the alternate reality espoused by one group, calling itself the “Free the Streets Coalition,” who believe the city’s streets are too unfriendly to cars. 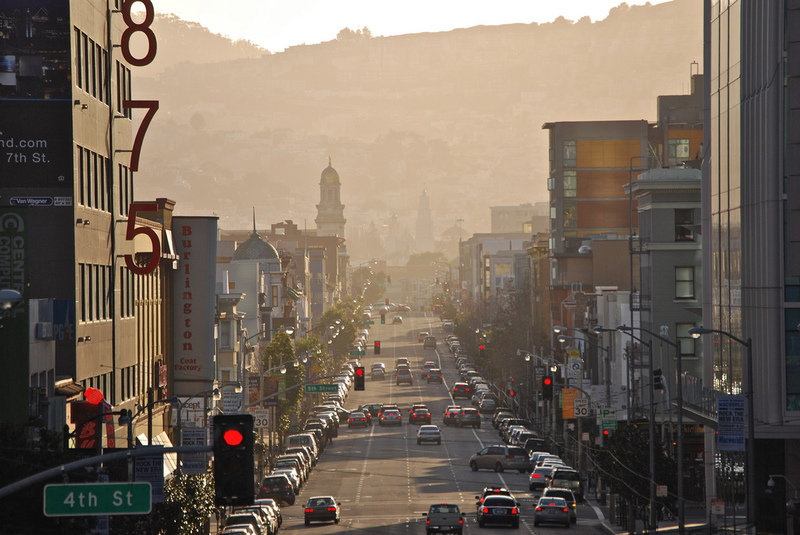 The “coalition” of undisclosed size has filed a ballot initiative with the city seeking to “restore transportation balance in San Francisco.” Chief among the group’s proposals is permanently enshrining existing free parking hours, prohibiting new parking meters except by petition, and encouraging the creation of new parking garages. The group has only released the names of three organizers — Jason Clark, who ran on the Republican ticket for State Assembly in 2012; Claire Zvanski, the former president of the Health Service System Board; and David Looman, a political consultant. These folks don’t see the SFMTA Board’s recent reversion of Sunday parking metering at the behest of Mayor Ed Lee as a sign of how motorist entitlement already holds sway at City Hall. Instead, they see the fact that the policy was instituted in the first place as a sign that motorists are a persecuted group. The status quo of free parking giveaways cannot be impinged upon — not even a bit. “We hope to repeal Sunday parking meters forever, not just as a gimmick to encourage motorists to support higher taxes and fees this November and in future elections,” the group said in a sheet sent out to the media. We achieve transportation balance when pedestrians, bicyclists, drivers and transit riders all can share the roads safely and efficiently. When a parent with small children is able to drive to the store, park nearby, and get their shopping done with a minimum of hassle. When commuters are able to board a Muni train, street car, or bus and know it will get them to their destination on time. When pedestrians know if they follow the signals they will be safe crossing an intersection. When bicyclists are able to navigate our streets in a way that gets them to their destination quickly and safely. When disabled individuals don’t have to leave two hours before a doctor’s appointment because they cannot rely on Muni to get them there or are concerned there will not be a parking space close enough to the office. Well that all sounds good. So does free ice cream for everybody. But what does this vision have to do with free and abundant car parking? Keeping curbside parking free or underpriced just makes it harder for people who are driving to find an open spot, which leads drivers to circle around distractedly in search of a spot, creating congestion that impedes transit and other drivers. And adding more garages just means there’s less space for useful human habitat — things like housing, stores, and workplaces. In the real world, this makes it harder to walk and bike places, while generating more car traffic that clogs the streets and slows down everybody — including people who drive. The group would have to collect 9,702 valid signatures by July 7 for their initiative to qualify for the ballot this November. “We anticipate surpassing that number,” they said. Read the group’s full Q&A here [DOCX], and the text of the ballot initiative here [DOCX]. Is anyone really surprised that after Mayor Lee starts giving away parking the car nuts would act like babies and demand more. If the comments on Streetsblog are anything to go by, the Mayor has already alienated and turned a lot of transit and bike oriented voters against him and his measures. I for one will be voting against funding more free parking and when talking with friends I’ll mention that if SFMTA really did need more funding for Muni, they wouldn’t have spent what they had already on free parking. Looks like you analyzed city financing in great detail to the conclusion that amenities that benefit cars are provided free to car owners. Perhaps you could provide details of where the money comes from in a future article. Did “Restore Balance” Petitioners Lie About Sunday Meters for Signatures?